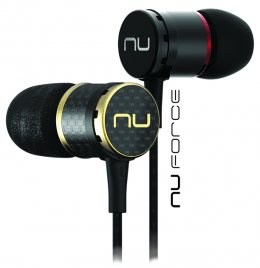 Home Competitions Win a pair of NU Force Headphones! Research has shown that listening to music while working improves business productivity – so it makes sound business sense to get a decent pair of earphones. Whether watching films on a flight; listening to music while at work or on the daily commute; or just making calls from the mobile, business people can get better sound quality with Optoma Nuforce’s new earphones. The new ultra-lightweight NE750M and NE800M earphones, unveiled by Optoma Nuforce, offer a substantial upgrade from the standard earphones that come with smartphones or music players. The earphones are equipped with a long 1.3m tangle-free cord and smartphone-compatible inline remote and mic that lets you pause or skip tracks, take and end calls easily. They also come with a handy carry case. Engineered with carbon fibre, the NE800M earphones offer outstanding sound quality with powerful extended bass. Carbon fibre, with its high strength-to-weight ratio and inherent damping properties, is one of the most acoustically inert materials known to modern science. The NE800M nozzle has been machined from solid brass to prevent micro-dynamic vibrations and achieve the ultimate musical reproduction. Brass also offers potent anti-microbial properties. The single driver features a large 8.6mm titanium-coated diaphragm with aperiodic bass loading which reduces ear pressure for extended wearing comfort. Its exceptional power, frequency range and transient response results in remarkably clear distortion-free sound. These earphones are precision machined from aircraft grade aluminium to eliminate unwanted vibrations for a clear, more detailed sound. They have a titanium-coated 8.6mm driver which produces exceptional sound quality with smooth, natural highs and deep powerful bass. The driver enclosure incorporates two acoustic chambers; each employing aperiodic loading to reduce inner ear pressure and listening fatigue. They come with silicone earbuds in small, medium and large. As well as the silicone earbuds that come with the NE750M, the NE800M earphones also include a selection of Comply™ soft memory foam earbuds allowing the user to find the perfect fit in their ear.